The price of oil is sky rocketing and the price of a Tanklok is now less than a stolen 5 gallon drum of fuel – act now before it’s too late! 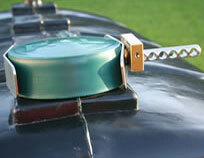 Tanklok can secure your oil tank and reduce the risk of your oil being stolen. Simple to install (5 Minutes). Long Life Stainless Steel and solid brass design. The padlock shaft is inside the stainless steel shaft so it is inaccessible to bolt croppers. Could save hundreds of £££££ in stolen oil. Many thieves steal 3 or 4 five gallon drums of oil from your tank at a time so you do not realise a theft has occurred. Then they return at a later date. Two houses side by side one with TankLOK one without. Which house will the thief target? Why would you leave £1,000 worth of goods unlocked?